We did make it to Calvin Coolidge’s house (and town) after we clarified my fuzzy childhood memory at OMITM. Just the location itself makes Plymouth Notch worth visiting. 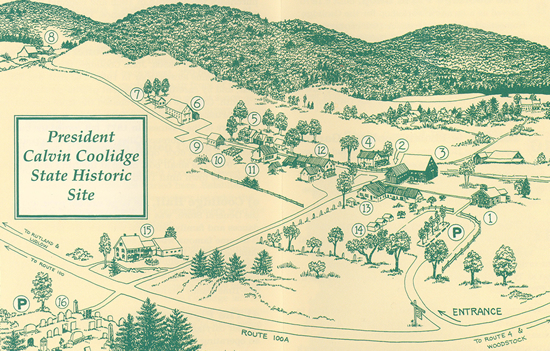 The town (almost all of it dedicated to Coolidge) is nestled among the rolling hills of central Vermont. By the time we found the site, the skies had cleared and the late autumn afternoon could inspire perfect-poetry-writing moments (if I wrote poetry, which I don’t). You’re not only visiting his boyhood home, but also his birthplace, his church, the cheese factory and his neighbors’ houses. He is buried in the town cemetery. I took this picture of the site’s webpage just to show you the extent of the what you see. If you’re traveling with children but hesitate to visit “old houses,” this site has plenty of outdoor space. This is the place where Calvin Coolidge’s father was justice of the peace and where Coolidge himself took the oath of office. The Coolidges were vacationing there when Harding died of a heart attack/stroke/poisoning out in California and in the light of a kerosene lamp, he took the oath of office from his father (a notary public). Calvin Coolidge is best known for his lack of words and for his New England demeanor: hard-working, frugal, steadfast and practical. Coolidge died while putting together a puzzle of George Washington. This morning I headed north for “Niece” Mickayla and Stephen’s wedding. (Mickayla isn’t really my niece; we just consider ourselves related because her grandmother was a Weddle). This picture of them was not taken today, because I wanted to be fairly uninstrusive with my camera and we were sitting quite a distance (with several people in between) from where they were sitting. Because of Mickayla’s Jewish heritage, the wedding had many Jewish traditions. The cantor was Michael Wechsler, a professor at Moody. Some of the traditions incorporated were getting married under the chuppah (canopy) which symbolizes the home they are to establish. Mickayla also walked around Stephen seven times; the seven circles representing the seven days of creation and symbolizing creating a new life together. They also included the sheva brachot or seven blessings which bless the Lord for who He is and His creation of marriage. At the end of the ceremony, they broke the glass symbolizing the destruction of the temple and also the permanence of marriage. The reception was held at the same facility as the ceremony and we were ushered into a beautifully decorated banquet hall for a great meal – and some bottle dancing. So excited for Stephen and Mickayla as they begin a new chapter in their lives. Alicia (the other “niece” and maid of honor) talks it over with Sue. An unlimited supply of candy for guests to put into little bags to take home – to remind them of the sweet experience they had today. Joel checks out the cake. Each table number card had a paragraph about a place special to the couple. You can’t tell too well – but in the far left corner is a staircase where the bridal party entered the banquet hall as they were introduced. The first thing we saw as we entered the building was an elegant display of candles and rose petals around a pond. The Cougars had lost eight in a row – but managed to win tonight against the Wisconsin Timber Rattlers (Appleton). We got our name announced over the public address system – and managed to have them wish Tami a Happy Birthday, too. So here are some scenes from our night at the game. Right now my brother is focusing on pictures of people sitting in his red chair. If you look closely, you’ll see him taking a picture of Dale and Luann down there by home plate. The game was NOT in progress at this time. I took the three munchkins. Niece L. thoughtfully eats a french fry as the action happens behind her. Cougars get ready to win. 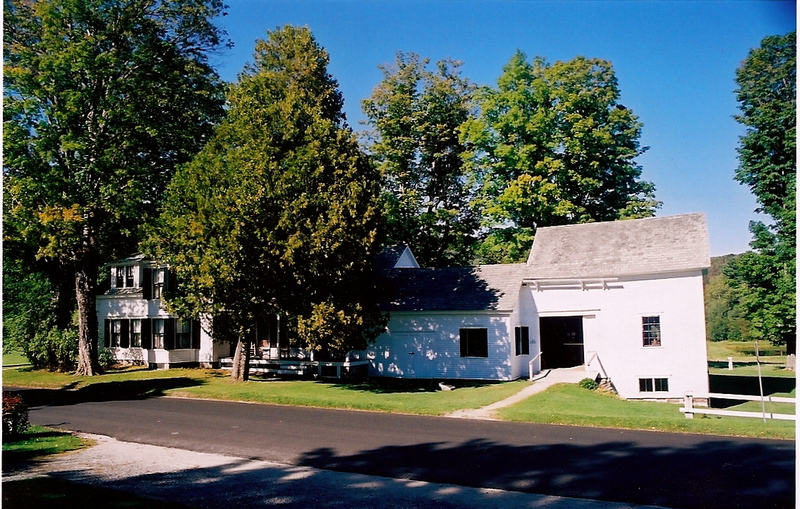 The next President is Calvin Coolidge whose house is in Plymouth Notch, Vermont. But before taking you there – I want to go on a side trip. The first true roadtrip I remember taking was the summer between first and second grade. Before that, we had made trips to my grandmother’s house in New Jersey or to Thousand Islands in upstate New York, but this time we were going on a TRIP! Our destination – Maine, New Hampshire and Vermont. I was seven and my memories of that trip are vague – except for a couple hazy recollections. Second I remember that we were there during a hurricane or at least the fringe of a hurricane. One evening the rain came down so incredibly hard, that Mom (who did all the driving because Dad was legally blind) pulled into the parking lot of a drugstore/grocery store/strip mall. I can’t exactly remember WHERE we parked, but I remember sitting in the car, playing Old Maids as the rain pounded down on the roof. Third I remember going to see The Old Man in the Mountain. 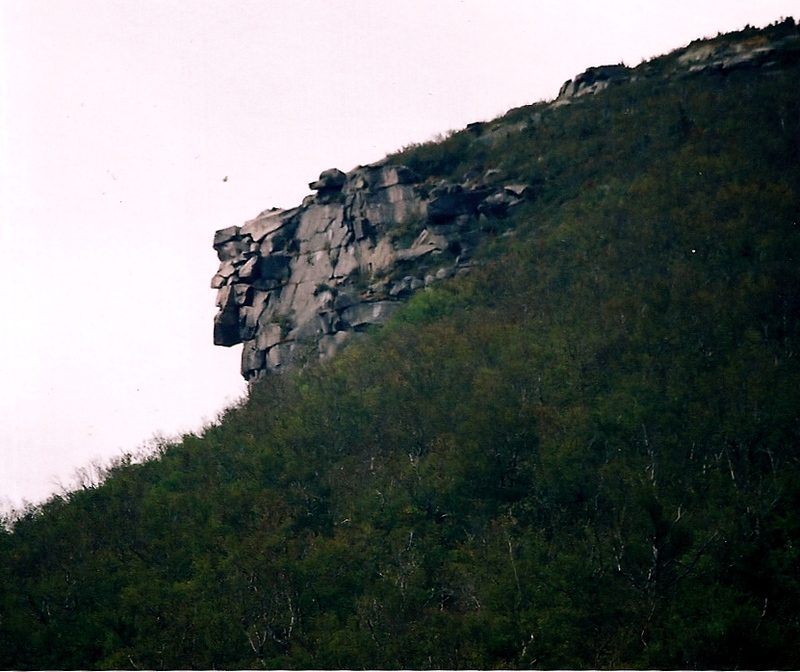 This was a series of five jutting cliffs in the White Mountains that looked like a man’s face. He was first spotted (at least in recorded history) in 1805. My seven-year-old brain was curious about seeing a man carved out of a mountain. I remembered it being a narrow road with lots of cars and people and the day being overcast, so we didn’t really get a clear view. Which in my young mind, made the figure even more mystical. 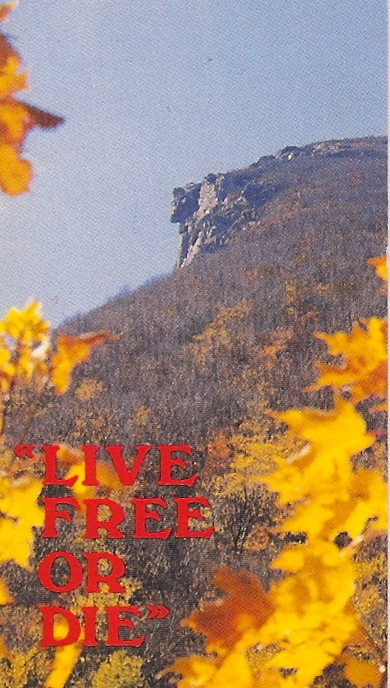 The picture above is from a postcard we bought that day. I think because I HAD the postcard, the memory of that day stuck in my mind: standing there on the road, straining to see the face of man through the mist. But I didn’t go back to New England as a child. 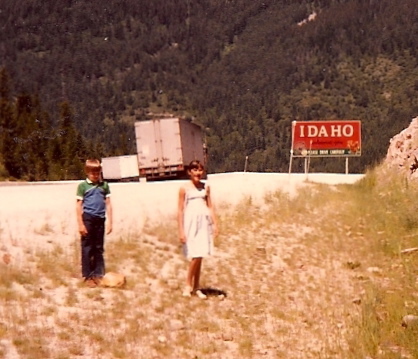 A few years later, we moved to the Midwest and our trips tended to be further west. We did take the kids back one year, but our trip through the three states was a breakfast in Maine, lunch in New Hampshire, dinner in Vermont – we can-check-those-three-states-off our list type of trip. No major site-seeing on that day. Though I thought about the OMITM, I knew it wouldn’t happen THEN. Then in 2002, Ken and I were asked to speak at a conference in Portland, Maine and we took some extra days to actually see the area a little bit, but there were so much we wanted to see, we had to greatly limit ourselves. 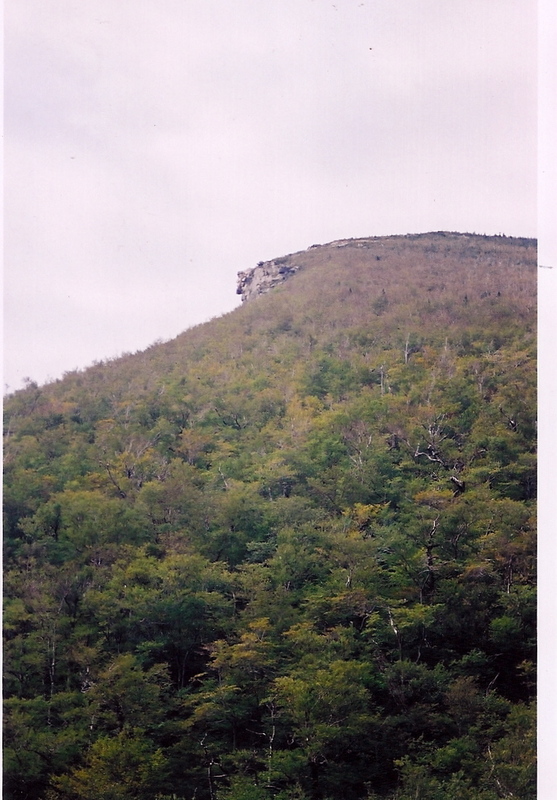 We left Maine and were heading West and I said, “I really want to go see The Old Man in the Mountain.” Ken knew the story of my vague memory and knew that somehow this was important to me. “I thought you wanted to go to Coolidge’s house,” he said. We checked on the map – 70 miles out of our way. But we’d see some new country and The Old Man in the Mountain. So – we did it. The road was now wide and a few cars were in the parking lot. We got out and hiked around the base. This day was cloudy, too, but we could see him without any problem. My picture now had clarity. Seven months later on May 7th, 2003 between the hours of midnight and 2:00 a.m., the Old Man collapsed. After 200 years, he is no more. As anyone who has been around any kid knows, the latest trend is SillyBandz. These are rubber bands in shapes of animals, letters, spaceships, etc. Kids wear several at a time – as bracelets – which create bumpy, colorful jewelry. But when they take the rubber bands off, the bands return to their original shape. One store in our neighborhood sold out 100 packages in three hours. 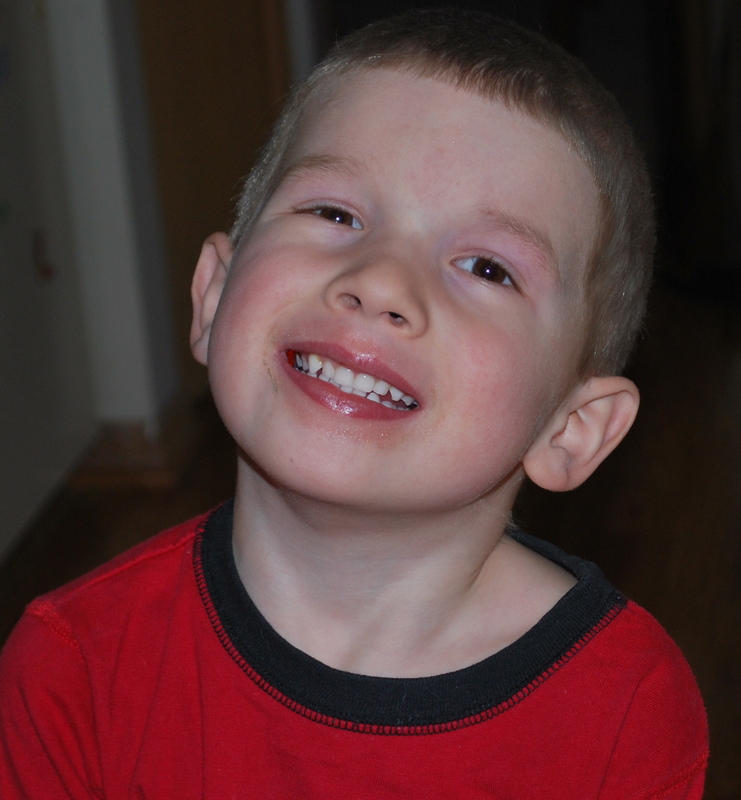 Anyhow – Lauri, my Pennsylvania friend gave a couple of the bracelets to each of the kids whom she teaches in preschool. A couple days later one little boy came back with a band on his arm, but it was a different color than the others and Lauri didn’t recognize it. “Did you get some more bracelets?” she asked. “What did he gave you?” Lauri was puzzled. “A potato.” The boy announced, taking off his bracelet. And proudly showed Lauri a regular, old rubber band. So, today we went to Olive Garden and as we were eating, the manager came around (spreading good will and cheer as restaurant managers like to do) and asked how everyone was doing and if we liked the food. We assured him that we were fine and that the food was fine. So then he asked if I cooked and I said I did, so he said that if I liked the dish I was eating – the recipe was on their website. I did like it and it was the type of dish I liked to make. Kelli said she had been on the website and had seen the recipes. Then the manager gave us his card and said if there was anything else we wanted all we had to do was ask. The 6yo was not about to let that pass. “Can you give me free ice cream?” He smiled. And that is how the 6yo got free ice cream, not only for himself, but for his two sisters. 3. I have another overdue book. At least I’m consistent. 4. I really don’t like it when you go to a business to have them do something and the person there tries to talk you in to doing something you don’t want to do. If I wanted to spend three times as much money, I would’ve come in with the plan. Just listen to me and do what I ask. I’m the client. 5. My neighbor’s 10 year old is having a slumber party tonight – Ten little boys running around the neighborhood. 6. Attended a very elegant high tea today (I was invited by a special lady) with shrimp cocktail, little tart-sized quiches, hot scones and delicate cakes. I drank iced tea, but soft drinks were also served. When the sweet, efficient, friendly server refilled my ice tea, she did so with diet coke. That first swallow was quite a taste sensation – especially since I was expecting iced tea. (Imagine half iced tea, half diet coke.) But not wanting to embarrass the server, I managed to keep it quiet. 7. OK. This is funny, but also a little scary. The dog knows how to open the back door. Yes, literally, how to open it. He jumps up and unlatches it and then walks in and wags his tail as if to say, “Here I am!” How did he learn this? We did not give him back-door-opening lessons. Did he just watch us for the past six years, all the time thinking, “I can do that.” I’ll have to take a picture of him to prove it. 8. I refuse to put the AC on before June.